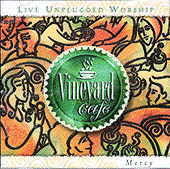 Mercy at the Fairground: Vineyard Music EXTRA! This article sets the scene for the recording of Mercy, the second Vineyard Cafe album. It was recorded at the Lancaster Vineyard, which, at that time, met at a fairground. The actual building was a large corrugated warehouse. It was about 110 degrees outside and there was no airconditioning inside except for swamp coolers: These are like large fans that pump air through water to try to cool things off. All it really does is make things humid, thus it seems even hotter. My team arrived in the morning and we started setting up for the recording. It went pretty slow since it was so hot. By early afternoon we were in full rehearsal. The only thing that kept the band going was cold water and M&M candy. We had no idea how many people were going to show, or even what the Lord had planned. The room has a coffee bar in it for their regular Sunday services as well as table and chairs. Not your traditional church setting at all, but perfect for a Vineyard Cafe. As we neared the start the place had well over 800 people sitting there. From the very first note people started worshipping. There is nothing like hearing 800 people crying out to God. The heat didnt stop them, the 3 plus hours of worship didnt stop them. In fact, they wanted us to keep going but the band was completely wipped out. Everything was so non-churchy, but they met God. Terry, Larry, and Brent were so personable and I had so many people come up to me and say, wow, you guys are just like us. That is so wonderful to hear because were all the same in Gods eyes, and sometimes people seem to think that worship leaders are something different. We never want to think more highly of ourselves that we should and we certainly want to be approachable. We just love God and want to worship Him like any other worshipping Christian. Copyright © Joe Randeen is the Producer of this album.